The Company reserves the right, without assigning any reason, to cancel, advance, reschedule, over-fly or delay the commencement or continuance of the flight without incurring any liability in damages or otherwise to the passengers or any other person on any ground whatsoever. The Company reserves the right to refuse to carry any person whom it considers unfit for travel or what in the opinion of the company may constitute risk to the aircraft or to the persons on board. Same day Passengers reporting will be in the morning time from 05:30 A.M. to 08:00 A.M. as informed and for night halt passengers reporting will be after 1030 hrs only and their slots will be as informed at Guptkashi Office. For same day return you will be given 60 - 90 minutes at Sh. Kedarnath Ji. Same day passengers would be given preference overnight halt and one way passengers. If a Cancellation / Change of Name is requested more than 72 HRS before the day of travel then 10% of ticket/s cost will be deducted. If a Cancellation / Change of Name is requested within 24 to 72 HRS before the travel then 50% of the ticket/s cost will be deducted. If a Cancellation / Change of Name is requested less than 24 HRS before the travel then 100% of the ticket cost will be deducted. If flight is cancelled by Arrow Aircraft Sales & Charters Pvt. Ltd. for technical reasons, passengers are entitled to full refund. Amount will be refunded within next 14 working days after receiving refund request. If flight is cancelled by Arrow Aircraft Sales & Charters Pvt. Ltd. due to bad weather, passengers are entitled to full refund with no assurance of accommodating them for the next day. However, efforts shall be made to accommodate the passengers on the next date of flying, if possible. In the case of a return ticket, if one leg of the journey is completed and the other leg is not completed either due to technical reasons or weather conditions, the passenger shall be entitled to refund of balance amount after one-way ticket cost. Amount will be refunded within next 14 working days after receiving refund request. The company is not liable to provide boarding/lodging/transportation to the passengers in case the operations are halted. Refund, if any will be made between 10 am to 4 pm only on producing the Original Receipt / PTD with Cancellation endorsement of Arrow Aircraft Sales & Charters Pvt. Ltd. Authorized Official. No Refunds are admissible on lost/photocopy of tickets or verbal approvals. Passengers are required to produce/intimate Aadhar Card No. OR PAN Card No. before issuance of the ticket, if failed so then ticket will not be issued to those passengers. In case of Children who do not have aadhar card, kindly use aadhar number of parents. Passengers are required to produce valid Biometric registration for Kedarnath Yatra. Government of Uttarakhand has made suitable arrangement for this purpose. Passengers would be allocated flights on 'First Come First Serve Basis' On the basis of booking if arrival time of more than one group is the same. Passengers are requested to report at the departure heliport at the notified Reporting Time. Passengers reporting beyond this time shall be treated as ‘NO SHOW’ passengers and the Company reserves the right to allot the seat to other passenger. Senior citizens, Women, Children, VIPs, Private Charter Passengers and Physically Handicapped passengers shall be given priority over others. Passengers are requested to follow all the safety instructions given at the helipad. Item of explosive nature, sharp objects like knife, scissors, blades, screw drivers, match boxes, cigarette lighters, firearms, crackers etc. shall not be allowed on board. In case a passenger is carrying any firearm, he has to declare it before hand to the Pilots and deposit it with him along with the license. Children above the age of 2Yrs shall be charged full ticket. In case of dispute regarding age of children/infants, valid proof of age shall be the only deciding factor. Following documents are accepted as valid Photo IDs; Valid Passport / Valid Driving License / Election Photo ID / Photo ID issued by Govt. / School Photo ID. Each passenger is permitted to carry only one handbag weighing not more than 02 Kgs. Reporting time is not to be confused with boarding time; boarding time may be between 1 – 2 hours after the reporting time. Passengers are requested to check the reporting time from the company/their agents two days before the journey date. It won't always be possible to ferry passengers with their own group due to weight adjustments so as not to exceed weight/load limitations. Operations subject to Govt. of Uttarakhand approval. Passengers weighing more than 80 Kgs have to pay Rs.150/Kg as overweight charges on spot and pax more than 120kg will have to take double ticket. Disputes, if any, are to be settled by Courts in Delhi who will have the Jurisdiction in this regard. All passengers are requested to carry woollens due to low temperatures. People with asthmatic and cardiac problems are requested to carry oxygen bottles. The helicopter travel ticket cost does not include VIP Priority Darshan tickets. Arrow shall facilitate the procurement of these 'VIP Priority Tickets' at a cost which is payable to Temple Committee. All same day return passegners are advised to procure the tickets for timely darshan and return. Buying a priority darshan slip for same day passenger is in his/her own interest so that he/she comes down the same day as planned otherwise it may result in a forced night halt at Kedarnath Ji. Cost in current season is Rs 2500/- per person which includes Rs. 400/- for prasad. In the words of Michael Lebouef, “A satisfied customer is the best business strategy of all”. Customer service is of high importance in the aviation sector, especially in private aviation industry.The significance of customers and the importance of providing them with a delightful flying experiences becomes a prime focus in the highly customer centric private aviation companies.This implies that the best Private Jet Company in Delhi has to understand the needs and requirements of the people for providing them with a unique and enriching experience. Great customer experiences can be implemented during pre, in and post flight phases. A very famous example of an aviation company focusing on experience as per R.Kollau (2012) is the Emirates who use the ‘Knowledge- driven In- flight Service (KIS)’ that allows the crew of the airline to evaluate the previous trips taken by the customers with the airlines. Such a strategy helps them understand the customer’s preferences and some of the issues that the customer might have experienced in prior journeys. If there is any information that shared with the crew members prior to the flight a massive boost in providing a more personalised and fruitful experience can take place. In a study conducted by Milay Tokshi found that for helping the customers in assessing and comparing service providers, the companies should try market their best tangible services. This implies that marketing the services which show the direct benefits that can be attained after using the service- these are the benefits that are based on a psychological understanding of what the aviation customer really needs. With the help of various marketing strategies the aviation companies build up their brand’s image in the mind of the aviation customers. For developing loyalty amongst customers and to attract the ones that were disgruntled due to competition, the Company private aircraft companies in Delhi should focus on providing special promotional services that uplift the customer’s sense of belongingness. What are the Basic Services the Customers Need for a Better Flying experience? ● Management Commitment to Customer Satisfaction: The management should maintain a scoreboard to evaluate customer satisfaction parameters on regular basis. ● Convenience of the customers: The booking and check in process, the pre-flight phase should be a seamless experience for the customers. ● Helpful and Knowledgeable Crew: The attitude of the flight and the cabin crew goes a long way to create a delightful customer experience for the clients and instils loyalty in them. ● Comfort: This is the inflight phase and several activities can be done to increase passenger experience. Providing customized meals, inflight entertainment, branded amenities elevate the customer experience. ● Safety and Security: This is of prime importance for celebrities, sports stars and politicians and few high profile individuals. A private aviation company should take several measures to maintain the safety and security of its passengers. 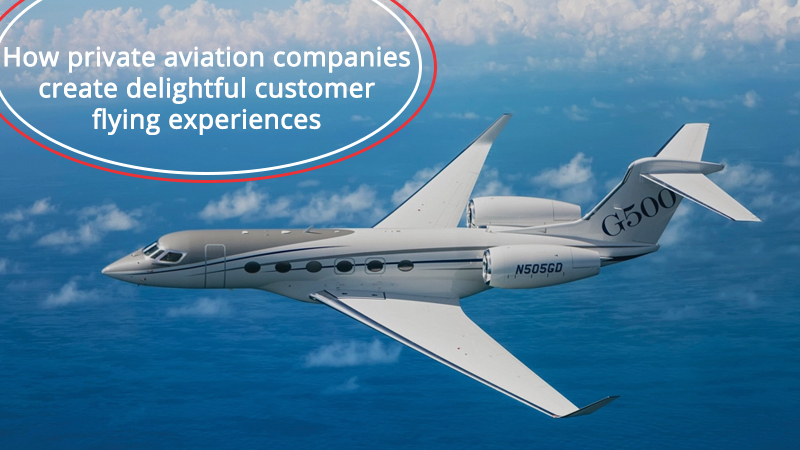 Apart from loyalty, the private jet companies also work on other aspects that lead to a better sense of belongingness amongst the customers, such as being there for the customers before, during and after the flying experience. outcomes. Although, it also cannot be argued that using small opportunities to sell or deliver better services can be the key for enhancing customer experience. Here are some of the ways the private airlines company can make the customers experience flying like a VIP. simply because they forgot about online check-ins. Share information about boarding passes on the email or through messages. The purpose is to make the process of getting into the flight an easy and less time consuming process for the customer. During the layover the flyers usually find themselves lost and this opportunity of serving the customers to improve their experience should not be missed. Help the customer to find their way to the next flight or for longer layovers- the sponsored partners can be promoted for various services like where one can eat or stay. The airlines can double up the excitement of the customers by dropping the insights about places they can visit while waiting for the next flight with various offers from nearby locations. the basis of different services provided (by gathering more information and staying connected with the passengers after the flight you can serve them better in future). when the tickets to cities a passenger has visited before go on a sale with great packages and high quality images of the destination. © 2018 Arrow Aircraft Sales and Charters Pvt. Ltd, all rights reserved. ARROW AIRCRAFT ®, “ GIVING WINGS TO YOUR SUCCESS ” are registered trademarks of Arrow Aircraft Sales and Charters Pvt. Ltd.